A luxury 2 bedroom apartment set in beautiful tropical gardens providing the perfect holiday destination for couples or Families. It boasts a large 28ft swimming pool, sundeck, and large canopied shade area. Plenty of loungers so no need to put your towel out in the Morning! Inside you will find everything you will need for your stay, with a fully fitted kitchen all pots pans and utensils needed, a Dishwasher, cooker, microwave, kettle, coffee machine, Iron, travel cot, and high chair. The master bedroom is en-suite and the second bedroom has an adjacent family bathroom all rooms have views of the Pool. The accommodation it self is very spacious including a 25ft veranda stretching across the front elevation with steps leading directly poolside (there is a gate for child safety) Veranda includes seating, dining table, chairs and gas BBQ for al fresco dining. A short 5 min walk up the coast road and you will find the largest and finest Marina in the Carribean, it is on the favourable southwest coast of Antigua. There are various bars and restaurants. 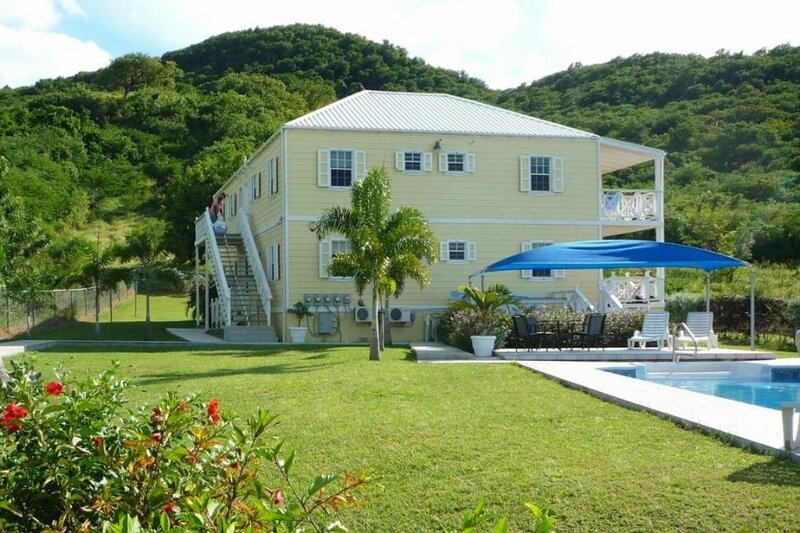 Jolly Harbour has banks with ATM's, boutiques, hairdresser, internet Cafe, an 18-hole golf course, Olympic size swimming pool, tennis and squash courts, as well as access to two of the most beautiful beaches on the island - Jolly beach and Hermitage bay. Jolly Harbour also boasts a fully stocked large supermarket with everything you could possibly need. Wi-Fi connection free at bars and cafes. Car hire is recommended to see the island but if you plan to stay local you can walk to 4 of the best local beaches out of the 365 beaches this beautiful island of Antigua has to offer. Sugar Ridge a newly built $50 million boutique Four star Hotel and Spa is just next door! don’t miss out on two for one steak night on Wednesday they also offer holidayers daily/weekly memberships to their health club at reasonable rates the Management have agreed to 20% of Spa and discount Gym membership for my guests so please let me know if you intend to take up this offer. Just across the road is the West Coast Village which has a Lobster Restuarant - again offers discount to my guests, also it has an Irish Pub, Curry House, bars and much more for tourists. Hamilton House is a small and exclusive development allowing guests privacy to relax in the landscaped gardens or laze around the pool, yet near enough to enjoy the local beaches and attractions that Antigua has to offer. Antigua is regarded as one of the safest Caribbean islands and the Jolly Harbour area even more so. Situated in the picturesque Jolly Harbour Marina, presents you with a unique opportunity to captain your own 11-foot, 2-seater inflatable Reef Rider boat on this award-winning snorkeling tour. Sugar Ridge is newly built $50 Million four star hotel and spa next door to Hamilton House. Valley Church beach, Jolly Harbour. This is on the nearest and many of our guests favourite beach. Miracles - Valley road. Jolly Harbour. This is our favourite Restuarant just 5 mins up valley road towards Jolly Harbour entrance (We love the Curry Goat it is a must) or why not try their traditional freshly locally caught Lobster as Fresh locally caught fish is brought in everyday. You can choose from Mahi Mahi, Snapper, Wahoo, Tuna and sometimes even shark! Sheer Rocks - Ffryes Beach, Valley Road. This beautiful Restuarant on the cliffs at the back of coco bay will blow you away. Directions : You take the right towards fryers beach and then first right up towards the entrance of Coco Bay. Dennis’s Cocktail bar and Restuarant. This is situated on many visitors favourite beach here you will find the George Family ready to serve all your wants and needs, also a water Park which Children and Adults will both enjoy. Crabbe Hill Beach, Valley Road. Open 10am to 10pm. Jazz extravaganza on Fridays, live entertainment on Sundays. All across Antigua you can find what may, at first glance, appear to be regular pineapples, but if you pass up on sampling the Antigua Black Pineapples, or just Antigua Blacks for short, you'd be missing what many call the sweetest pineapple on the planet. Check out Cades Bay Agricultural Station 10 mins down south on Old Road to learn the history and explore the Antigua Black's cultivation first hand. Before you leave Antigua be sure to pop into ‘The Tailors Daughter’ souvenir shop situated opposite Virgin Atlantic departure gate, this gourmet gift shop offers a line of of products that resets the standard of elegant Caribbean gifts. Pick up the perfect souvenirs and take home with you memories of Antigua.